No plants or other decorative objects included in this item! Material: Natural Wood Log and high-quality glass. 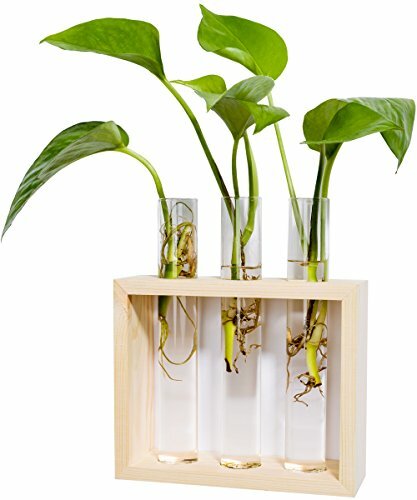 Creative and unique wooden test tube rack including three transparent test tubes,seems that your plants are come from amazing chemical reactions. An eye-catching novel design for smaller plants, looks gorgeous hanging on the wall.Besides, you can also put some flowers in them and place them on the table for ornament. Beautiful, attractive, amazing home decoration for house, garden and workplace. Size: Wooden Frame:6"(L)*2"(W)*5 1/8"(H) Test Tube: 6 3/4"(H) *1" (Diameter). Material: Natural Wood Log and high-quality glass. No plant or other decorative objects included in this item! Mkono is a registered trademark and our product is professional manufacturing and sole selling.